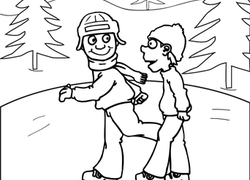 This winter coloring page featuring two cheerful ice skating buddies enjoying the skating rink will keep your child engaged and excited indoors! 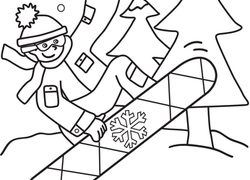 Give your child this sledding coloring page and he'll be psyched for the snow in no time. This mandala is of winter produce, and features fruits and veggies that taste best during the winter: kiwis, broccoli, kale, and more. Get your child in the spirit of the season with the coloring sheet of a jolly snowman. An adventurous kid is conquering the slopes in this exciting snowboarding scene. 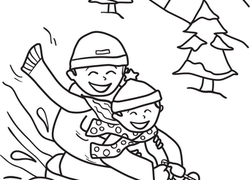 Wintertime means sledding fun in this coloring page. Teach your kid about the importance of taking care of herself and being thoughtful about the well-being of others as she completes this coloring page. Which of the four seasons is your child's favorite? Inspire them to get into writing with this introductory prompt. Nouns are an important part of every sentence! What would happen if we tried to write a story with no nouns? This Christmas village house is waiting for your child to cut and fashion it into a 3D holiday scene. Make a Christmas village house, or a whole set of houses. Experience the best of the winter season with this fun-filled scavenger hunt! It's a Christmas bear coloring page! He's almost ready for Christmas, too. Can you colour him in so he looks best for the holidays? Everyone should get their flu shot once a year -- mom and Dad, this goes for you, too! This Christmas coloring page features Santa showing off holiday magic as he delivers presents on a winter night. Get your kid excited for Christmas and spark her imagination with this coloring page set in the North Pole near Santa's workshop!